The Ester Polyester Film Type EX is a Bi-axially oriented transparent polyester film where one side (either inside or outside) is a co-extruded layer of special co-polymer. This film is suitable for applications which require high thermal treatment / exposure and resistance. This film possesses low haze, high clarity and gloss along with good frictional, mechanical and thermal properties. The modified co-extruded surface has excellent adhesion with solvent based inks, adhesives, release coatings, varnishes, primers (resulting in higher bond strength in the final laminate) which make it suitable for high end packaging applications like hot fill, boiling, retorting etc. 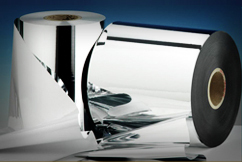 Laminates made by using this film offer good heat and mechanical resistance to various processes like hot fill & retort. Liquid concentrates, shampoo, wet tissues etc.